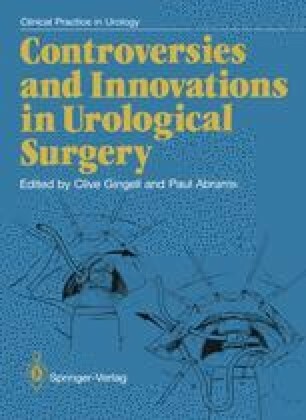 Periurethral polytetrafluoroethylene (Polytef, Teflon) injections were first introduced for the treatment of urinary incontinence over 20 years ago and the results have shown that the method has an accepted place amongst the extensive repertoire of operative procedures that have been described. This technique is simple to perform, only briefly extending the length of a routine cystoscopic examination. The period of hospitalisation is short, approximately 2–4 days and no serious complications have been reported. The injection may be repeated and, if subsequent surgery is necessary, the Teflon deposits do not prejudice the operation. Age and obesity do not present contraindications.